I don’t know what the first column is. 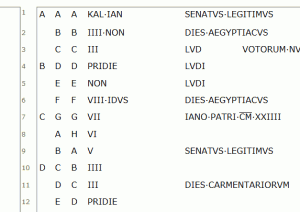 The second column, in Roman numerals, are the days of the week, 1-7. Each week of 7 days corresponds to one of the 4 phases of the moon, which results in the “lunar month” of 28 days. But what about the third column? This shows a “week” of 8 days, numbered 1-8 in Roman numerals? These are the nundinae, the “nundinal days”. How do we know this? Well, we might look at the “Latium parapegma”. This is a slab of rock with inscriptions on it, with holes against the words. Here’s a photograph, followed by a proposed restoration. 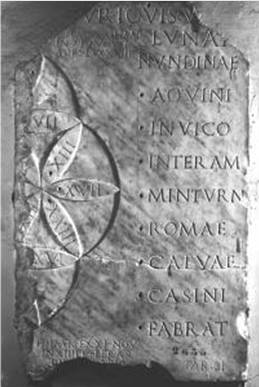 Note the “nundinae” column on the right hand side. Note the peg hole, and the list of 8 names. Most are the names of towns in Latium, except for “in vico”, i.e. in the village, i.e. “here”. This is, I am told, all about market days. Once every eight days, there would be a market and the farmers could buy and sell there. So there was a cycle of eight days. It is hypothesised that each town held a market on a different day, and therefore the names above indicate which town was holding a market on that day. The word “nundina” is supposed by modern scholars to be derived from novem and dies, i.e. nine and day. We count 8 days from market day until the next market day; but the Romans counted both market days in that span, making a total of 9, or so I am told. It would be most interesting to see the data on which all this is based. A word about peg-calendars (parapegma) is perhaps in order. I learn from Lehoux that the peg calendar is a farmers’ tool. It was necessary because the secular calendars did not keep in sync with the seasons. We all know how the Julian calendar came into being; because the Roman calendar had drifted so far away from the real months that winter was in summer and so on. Likewise politicians would muck around with the calendar for political advantage, adding days and so on. But this caused a real problem for the farmers, who needed to put their crops in the ground and gather the harvest at set times in the year, when the weather was right. Their solution was to follow the fixed stars, which rise and set regardless of politics. And they could then keep track of days using a bunch of lists, and move a peg along the list, each day. 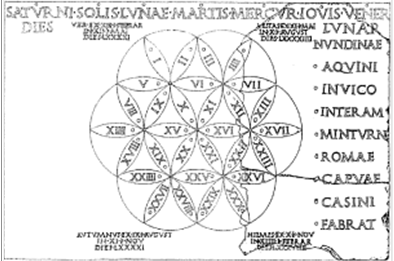 If they had a slab with several lists on it, as in the Latium parapegma, this would synchronise all the various markers; days of winter, nundinal days, ordinary week days, and so on. In this way the farmer could know what time of year it was and when to go to market. It makes you grateful for modern calendars! It also raises a question. If illiteracy was so widespread in antiquity as some assert, why do parapegmas exist? The answer is perhaps that middle-class illiteracy was by no means as rare as some might think, and that farm managers would need to be both literate and numerate. I’ve continued working on the PHP scripts for the new Mithras site. It’s slow, because I don’t do much development work in PHP. The reason for doing this is so that I can work on the site from anywhere, work or home; and so that it will support things such as footnotes, not found in standard HTML. I was struck today by the conviction that HTML is travelling in the wrong direction. I remember the first HTML. It was simple, and anyone could master it. Today I learned that all of the attributes on the horizontal rule element, the plain old <hr> tag, are to be unsupported by HTML 5. If you wanted a single line, all you had to do was <hr size=1>. Now, to achieve the same effect … well, I did a google search, and had to experiment to find a CSS syntax that would work. There is a disease that affects software products. It happens when the developers forget that 99% of the time, the user is doing a few simple things; and start concentrating on the 1%. In this case the HTML developers are so busy trying to separate presentation from content — a mantra of much software development, and not a bad thing — that they have forgotten that the first, most important thing is that creating a web page should be SIMPLE!!! Idiots. I’m still under the weather, but I also opened Daryn Lehoux’s book on ancient weather and calendars, and made a start. I was deeply impressed by the opening pages, which gave a remarkably clear reason why such calendars were necessary, and nicely anchored it in farming in modern society. Someone give this man a professorship: he has managed to produce a seminal piece of work on a very difficult, highly technical subject, and has done it in such a way that any reasonably educated man may get up to speed. Marvellous! I’ve been doing some more work on the Mithras Project pages. This has been entirely PHP and perl coding, tho. Daryn Lehoux kindly sent me a copy of the paperback of his book, Astronomy, Weather, and Calendars in the Ancient World. CUP are now selling this on Amazon at USD$40. It’s very excellent, and I shall have to spend some time with it, once my pile of books from last weekend diminishes!